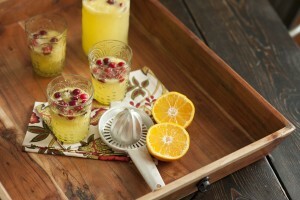 Gluten-Free Living > Tips > What beverage should I serve at my New Year’s Cocktail party? What beverage should I serve at my New Year’s Cocktail party? Make this Holiday Spritzer! When trying to avoid sugar or gluten, beer, soda and other popular beverages are not an option. Rather than getting stuck with water or another boring drink, why not serve something everyone will love? The combination of sweet citrus, sour cranberry and spicy ginger plays well with the flavors of the season. Offer some flavored vodka or rum to spike it up a notch.